Track athletes competing in the 400 and 800 meter events come in three types: sprinters, all-purpose runners or distance runners. 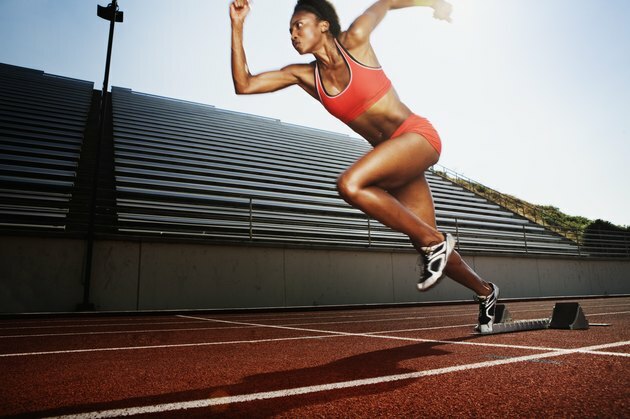 Regardless of the type of runner, 400 and 800 meter events require a blend of anaerobic and aerobic conditioning. As a result, specific workouts should be implemented into the training routine to maximize speed and endurance. The workouts must allow variability based on the skill level of the individual runner. Breakdown workouts are commonplace in a track and field training program designed to improve lactic acid tolerance. This single workout for one training session includes several runs that gradually decrease in length from 600, 500, 400, 300 and 200 m. Begin the breakdown workout with a 600 m run followed with a recovery period lasting the same amount of time it took to run it before moving to the 500 m. Run 500 m with an equal recovery period as the time it took to run; continue with a 400 m run and recovery before finishing with the final two runs of 300 m run and 200 m. You can do this type of workout once each week. Interval workouts are characterized by alternating periods of work and rest and can be customized to improve aerobic and anaerobic ability. An example interval workout that focuses on speed endurance is a Tabata workout that follows a 20 second on, 10 second off principle. Popularized by Izumi Tabata, this supra-aerobic workout begins by running as far as possible in 20 seconds, followed by 10 seconds rest and repeating for a total of eight rounds. The goal of the workout is to maintain the same amount of speed and distance for all eight rounds. Do to the intensity of this workout, don't do it more than once a week. Tempo runs for the 400 and 800 runners focus on the goal race time for the individual runner. These workouts train the runner to find the pace and comfort level with running at the specific speed. For example, if a runner wants to break the two minute mark in the 800, the tempo runs will use 200 or 400 m intervals based on the two minute 800 time. Start with a dynamic speed warm-up used to warm-up for a race and run a 400 m interval in 60 seconds followed with a 60 second rest. Run another 400 m interval at 60 seconds or faster that ultimately computes to a two minute 800 m race. Try to incorporate one tempo workout into your weekly training schedule. Ladder workouts use varying distances and times and are characterized by decreasing and increasing the distances and times throughout the workout. An example ladder workout using time starts with a one minute run, one minute rest, one minute run and 50 second rest. The ladder continues using one minute runs with decreasing rest times from 40 seconds, 30 seconds, 20 seconds and 10 seconds before going back up the ladder and then finishing with one minute of running, 50 seconds off and one minute of running. To avoid injury, don't do this type of workout more than once a week. Alternate it with some of the other workout options.